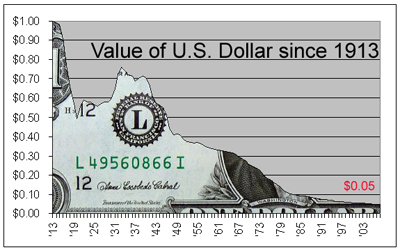 The U.S. national debt clock [http://www.usdebtclock.org/] is clicking and it is fast approaching the $12 trillion mark, all the while the Fed (less a central bank than the banks’ Bank) is printing new money like crazy and lending it to its client banks at close to zero interest rates (i.e. at negative interest rates). What is wrong with this picture? It simply means that most Americans are losing big at this game, but a handful of mega-banks and their affiliates are raking in tremendous amounts of money in easily made profits. [http://www.answers.com/topic/assignat] backed by the seized properties of the Catholic Church. Let’s summarize quickly the numerous ways the Fed (and to a certain extent, the U.S. Treasury) have found to channel cheap funds to the banks and to brokers. In September 2008, some investment banks, such as Goldman Sachs and J.P. Morgan, [http://www.bankreorealestate.com/industry-news/goldman-sachs-and-jpmorgan-to-become-commercial-bank-holding-companies.html] officially became commercial banks in order to profit from the Fed’s new generosity. • The payment of interest on the banks’ excess reserves at the Fed. [http://www.fool.com/investing/value/2009/03/19/bank-stocks-explode.aspx] have followed suit with tremendous gains. That’s why I say the stock market rally since March 5 (2009) has been a liquidity-driven rally, engineered by the Fed. Similarly, at least, some timid steps are being taken in the U.S. and in Europe to impose some limits or restrictions on the discretionary and exorbitant bankers’ bonuses. [http://online.wsj.com/article/SB125324292666522101.html] This comes a bit late, and we shall see if this is merely some political window-dressing to deflect criticism or if it is a structural step to curb oligopolistic and abusive banking practices. Rodrigue Tremblay [http://www.thenewamericanempire.com/author.htm] is professor emeritus of economics at the University of Montreal and can be reached at [email protected] yahoo.com. He is the author of the book ‘The New American Empire’. Visit his blog site at www.thenewamericanempire.com/blog.